Light, fluffy, super moist Vanilla Cupcakes with Fresh Strawberry Buttercream. With the perfect cupcake crumb and super creamy strawberry frosting – you’ll absolutely love these cupcakes. Ok – Who likes cupcakes? Scratch that. Who loves cupcakes? Fluffy, light, super moist vanilla cupcakes topped with delicious buttercream? 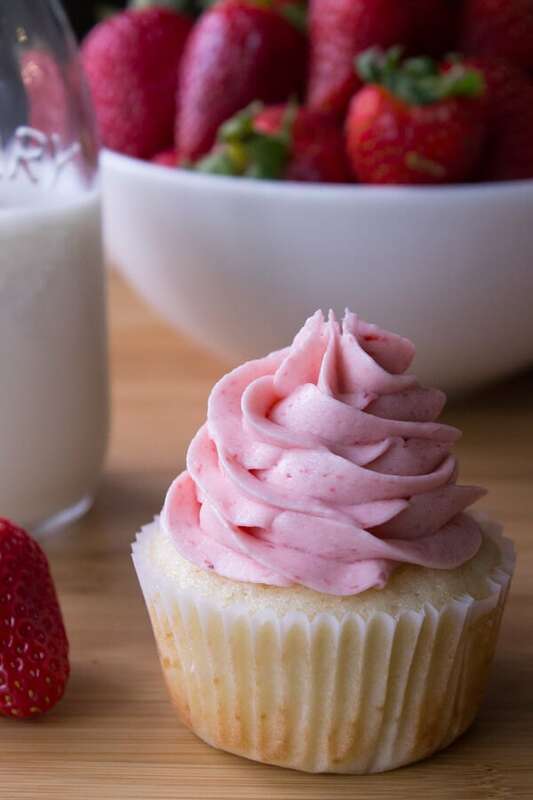 Delicious creamy buttercream made with fresh strawberries that pairs perfectly with vanilla? Cupcakes that look so pretty they belong in a bakery case? No seriously – everyone will love these cupcakes. You cannot not love these cupcakes. 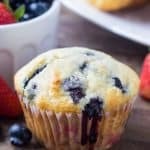 They have the perfect flavor combo for summer, the fluffiest cupcake texture and the softest crumb. Then the buttercream… Oh my. This is not that artificial, too sweet, fake strawberry icing – just completely creamy, smooth buttercream bursting with fresh strawberries. Yup – you’re going to love them. So what makes these cupcakes so delicious? First, for the light, fluffy and super moist texture. To make the cupcakes fluffy, you’ll need to really beat the butter and sugar together – after you’re done creaming they should be almost white in color. Then, you’ll only uses egg whites to up the light & fluffiness even more. Milk AND yogurt make your cupcakes super soft and moist. I’d recommend using 2% or whole milk for a more creamy & moist cupcake, skim won’t quite cut it. And be careful if using 0% fat yogurt. Yogurt with 0% fat often contains lots of gelatin which will change your cupcake texture – so just read your ingredient list to be sure gelatin is near the bottom. And finally… Cake flour. Cake flour helps create that soft crumb and adds more lightness. If you don’t have cake flour on hand (which lets face it… I often don’t), you can make your own using all-purpose flour and cornstarch – see the notes in the recipe for details. Problem solved. Now, for the delicious buttercream – this is where it gets a little tricky. Making the buttercream isn’t hard – but it does require a few extra steps than other recipes. 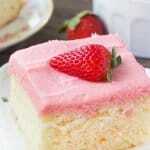 I have a whole post with tips on how to make fresh strawberry buttercream frosting. But here’s the main things you need to know. Because we’re using fresh strawberries, we need to be careful that not too much liquid from the strawberries gets in the buttercream or it gets too thin. So, first you’ll process the strawberries in a blender or food processor and then boil them down to make a strawberry syrup. 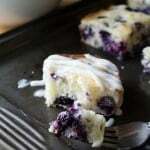 The syrup should be thick – almost jam like in consistency. And once your cupcakes are cooled, frost away! I used a piping bag and star-shaped frosting tip – but feel free to spread it on with a knife. (Psst…. they will taste exactly the same). Oh… And how delicious they will taste! Strawberry & vanilla in delicious, fluffy cupcake form – Yup, you’re going to love them! Vanilla Cupcakes with Strawberry Buttercream. Light, fluffy, super moist vanilla cupcakes topped with creamy strawberry buttercream made from fresh berries. These are cupcake perfection! Preheat the oven to 350F degrees and line a 12-cavity muffin pin with cupcake papers. I got 14 cupcakes total. In a medium sized bowl, whisk together the cake flour, baking powder, baking soda and salt. Set aside. Using an electric mixer cream together the butter and sugar on medium speed until light and fluffy (about 2-3 minutes). Continue beating and add in the egg whites and vanilla (another 30 seconds). Turn off the mixer, scrape down the sides of the bowl and stir in the yogurt. Mix in the flour mixture with the electric mixer on low speed, followed by the milk. Scrape down the sides of the bowl as necessary. Spoon the batter evenly into the lined muffin cavities - filling each about two thirds of the way full. I ended up with 14 cupcakes total. Bake for 15-18 minutes until an inserted toothpick comes out clean. Leave to cool in the pan for about 10 minutes then remove the cupcakes and continue cooling on a wire rack. While the cupcakes are cooling, you can start making the frosting. Process the strawberries in a blender or food processor until no lumps remain. Put the sauce through a wire sieve to remove the seeds. Then transfer to a small saucepan over medium heat. Add the granulated sugar, and allow the mixture to come to a gentle boil while stirring. Allow the sauce to boil for 10-15 minutes and reduce to about 1/3 of the original volume. Remove from the heat and cool in the fridge or freezer. In a large bowl using a hand held or stand mixer, beat the butter on medium speed until fluffy. Slowly add about 2 cups of the icing sugar and continue beating until combined. Beat in 3-4 tablespoons of the cooled strawberry sauce. Make sure your strawberry sauce is cold before adding it to the buttercream. Beat in the vanilla and the rest of the powdered sugar about 1/2 cup at a time until the desired sweetness & thickness is reached. 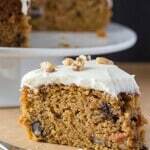 If the icing seems too thick, add in a tablespoon of whipping cream. Frost the cupcakes using a piping bag or by spreading the icing with an icing spatula. *If you don't have cake flour on hand, measure 1 and 1/4 cups all purpose flour into a medium sized bowl then remove 2 and 1/2 tablespoons of the flour. Replace the 2 and 1/2 tablespoons all-purpose flour by adding 2 and 1/2 tablespoons cornstarch. Whisk the mixture for about 1 minute then sift. Hi! I made the frosting and it was amazing. Do you think I could make an orange buttercream the same way. Peel the oranges, put them thru the food processor, etc? Let me know, thanks! So glad you liked the frosting!!! I think if you wanted to make orange buttercream, you’d want to just use orange zest and freshly squeezed orange juice instead (without boiling the fruit). 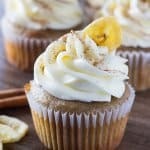 You could use this recipe for lime frosting, and just substitute the lime with oranges: http://www.justsotasty.com/lemon-lime-cupcakes/ . I’d probably add an extra tablespoon of orange zest since it’s not quite as strong as limes. These cupcakes are amazing. Easily the best vanilla cupcakes I have ever made. So light and fluffy.And the strawberry buttercream was delicious! Thanks so much for the recipe! My buttercream lacked any strawberry flavor. It looked beautiful but didn’t taste like strawberry. What could have gone wrong? I’m sorry that the strawberry flavor didn’t come through 🙁 It could have been a few things. If the strawberries were pretty white in the centers – then they wouldn’t have had a whole lot of flavor to add. I’d definitely recommend finding very bright red berries, and if the centers are white just cutting that part out and not including them. As well, the more you boil down the strawberries, the more concentrated the mixture will become and therefore give a stronger strawberry flavor. I hope this somewhat helps! And thank you for reporting back! I think it would be fine with peaches. However, I haven’t tried these exact proportions so I’m not entirely sure how many peaches/how much puree you’d need. I just made the frosting and I worry that I messed up somewhere along the line… I didn’t even add all of the powdered sugar and it is overbearingly sweet! I was wondering if there was a way to fix this without starting the entire process over (such as adding: lemon juice/zest, more butter, shortening, salt, etc.). Thank you! 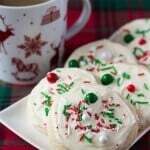 If you feel that the frosting is too sweet – I’d try adding a little whipping cream/heavy cream (1-2 tablespoons) or salt (just a pinch to 1/4 teaspoon). You could try a little lemon juice – I’d start with 1 teaspoon at a time. I wouldn’t try adding butter or shortening at the end though because it’ll be difficult to mix in and get the consistency creamy. As well, when it’s on the cupcakes the flavor will balance out a bit more since you won’t be eating straight frosting. I hope this helps! I make these every year for my daughter’s birthday. Could I replace the milk with moscato wine? I haven’t tried it myself – so I’m not 100% sure of the results. Looking at other recipes for Moscato cupcakes though – it seems like substituting the milk for Moscato would work. I hope your daughter has a wonderful birthday! Holy moly what a frosting! So so so delicious! I messed up the cupcakes and forgot the baking soda (I had run out and hubby picked it up…then I forgot to add to dry ingredients) they are still tasty but not as fluffy as I’d like :/ but still really tasty – can’t wait to make these again with the cake done right! Can this recipe be turn into a sheet cake?